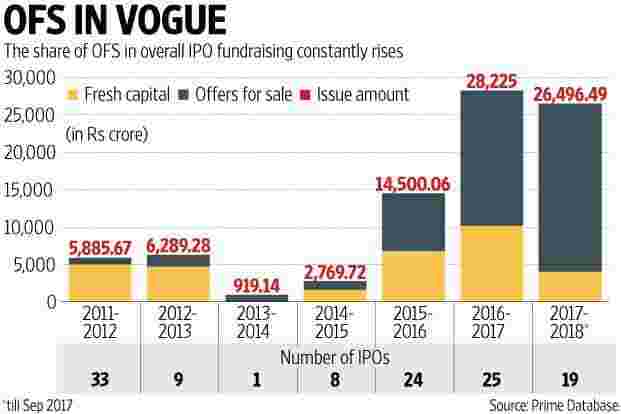 Fundraising through the initial public offering (IPO) route has been increasing. In the current financial year, so far, more than Rs26,000 crore has been garnered through IPOs. More companies are slated to join the IPO bandwagon in the months ahead. Interestingly, this IPO party is mainly driven by offers for sale (OFS), rather than fresh capital issuance. An OFS is a route for existing shareholders to sell their holdings in companies. The money from the sale goes to the selling investor. On the other hand, when a company raises fresh capital, it is selling new shares. The money raised goes to the company (rather than a shareholder). The company can use this money to meet its needs, for example setting up a factory or repaying debt. In FY18 so far, Rs22,453 crore has been raised through OFS issuances, shows data from Prime Database, a New Delhi-based market tracker. As the accompanying chart shows, the contribution of OFS has constantly increased in the past few years and is now at a record high. Some market analysts and investment bankers attributed this surge in OFS offerings largely to the sharp run-up in Indian equities, which has been used as an opportunity by investors, especially private equity funds, to exit. “The share of offer of sale (OFS) issuance has been rising from the past three years. This indicates that current shareholders are using this opportunity to monetize and also recycle capital," Samarth Jagnani, head of equity capital markets India at Morgan Stanley said. Another factor boosting this trend could be the change in share sale norms announced by Securities and Exchange Board of India (Sebi). In a bid to encourage retail participation in OFS, the capital market regulator relaxed norms for OFS in 2014. The changed rules stipulate a minimum 10% of the OFS issue size to be reserved for retail investors, those who bid for amounts less than Rs2 lakh. It allowed sellers of shares in OFS to offer a discount to retail investors. Further, it permitted non-promoter shareholders holding more than 10% to use the OFS route to exit. The OFS mechanism was made available to shareholders of the top 200 companies by market capitalization, which was earlier limited to the top 100 listed firms. Going ahead, fundraising through the OFS route will continue to have a larger share in the overall fund raising pie, market analysts said. Meanwhile, a sharp pick-up in the share of fresh fundraising could take longer. “Cash-intensive business like manufacturing and construction are already having excess capacity, so primary issuance or fresh fund raising will see an increase once capex revival happens, which is still sometime away," said Mehul Savla, partner at Ripple Wave Equity, a boutique investment bank.